I originally wrote this article for our local newspaper, The Evening Sun! I'm posting it here with some extra content so I can share my tips with all of you too! A little more than a year ago, my (now) husband popped the question. It was the perfect day. We lived in “ignorant bliss” for about a week or two celebrating… and then reality set in. Wedding planning is not an easy process and if people try to make it sound like butterflies and roses, they are lying to you. But every tear (you will inevitably shed) is worth it. Your wedding day/weekend is the best time of your life. In my experience, we ran into some challenges up front and then things calmed down for a bit. Finding a venue was a difficult one for us; we needed something that could accommodate our budget and guest list size, but my fiancé and I also have a very specific style. My advice? Find a venue that fits your style and be flexible with your date. You’ll end up spending a lot more money in the long run if you are trying to make your venue something that it’s just not. Love what you choose and then you won’t have to spend as much making it match your vibe. BONUS content: Luke and I had our reception at The Arbor Loft in Rochester, NY. Agathi and her team are a dream (woah.. I'm a poet!) to work with! Their industrial vibe was exactly what we were looking for. 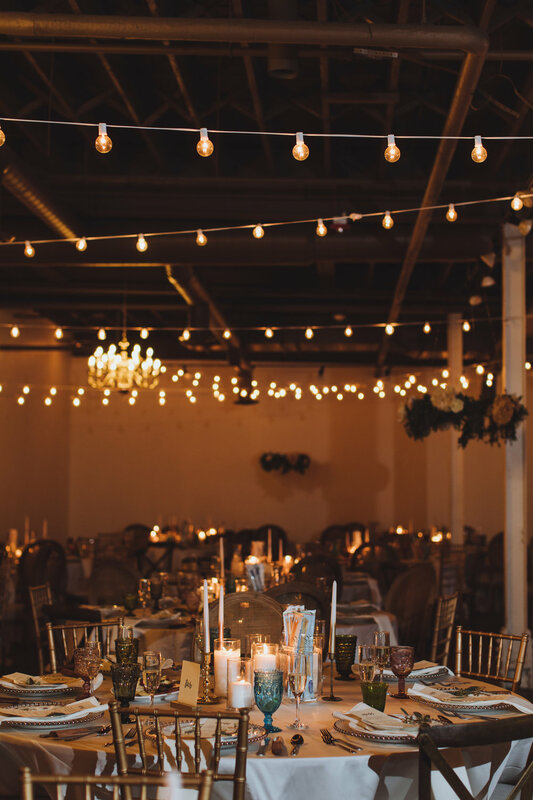 The venue comes with chandeliers, string lights and some vintage furniture included in your rental fee. Determining your budget as early on as possible will also help you in the long run. Once we determined ours, we were able to work off of that to determine how much we could spend on the venue, photographers, DJ, videographers, etc. These items are good to get out of the way early on because they will take up a good chunk of your budget, but these vendors can also book up quickly so you’ll want to secure them as early in advance as possible. One misconception is that planning a wedding in a small town can have its challenges. I personally didn’t find that to be the case and I’ve never let my zip code define me. The vendors that I worked with in our area loved our style and enthusiasm and truly worked with us to help make our wedding a success. What you put into your wedding is what you’ll get out of it and that can be true for any city or town you’re planning your wedding in. If anything, working with vendors in a smaller town works to your advantage because you get to work more one-on-one than you would in a bigger area. BONUS content: Working with vendors you know and trust will take a lot of stress off of you during your planning process and especially the weekend of. From our DJ (SpynMastaz Entertainment), to our cake maker (Kelly Banks Cakes), our caterer (The Horned Dorset) and everyone in between, I loved every single person we worked with and because so many were from our small town, it felt like we were working with family. Whoever came up with the phrase “the devil is in the details” clearly planned a wedding at some point in their life because that saying is SO true. This will become apparently clear about 6 months from your wedding date. For most of us, planning our wedding means we have to stick to a tight budget, which means you’ll have to make some tough choices about what your priorities are. With so many details that go into planning a wedding, determining what aspects are worth the financial investment can feel overwhelming! For me, social media platforms like Instagram and Pinterest were both a blessing and a curse. Just remember, what’s packed into a small graphic online can sometimes cost a fortune when applying that look to your entire reception. My advice? Make a Pinterest board packed full of everything you love in the beginning. Once you get more comfortable and start to narrow things down, go back through and notice what’s similar to each other and delete what no longer speaks to you. This can help to you understand your style and identify which things can make their way to the top of your priority list. You can also save money by taking on some DIY projects, too! Click here to check out my Winter Wedding Pinterest board! 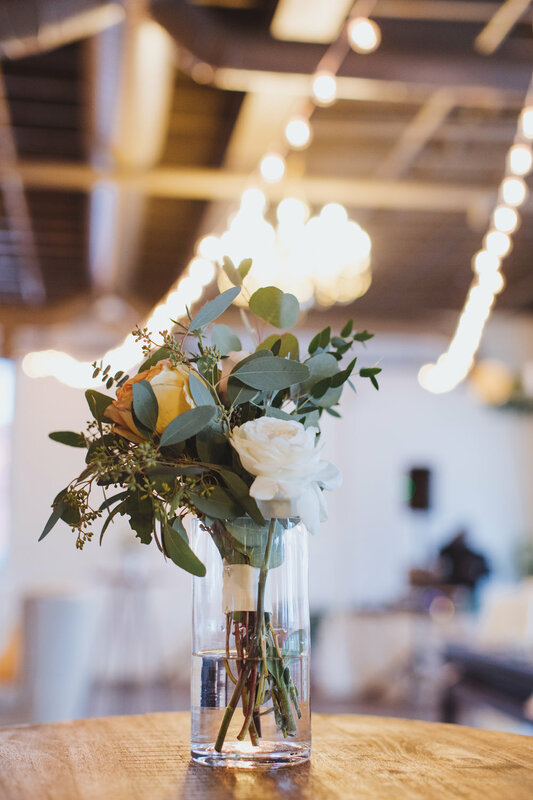 BONUS content: Repurposing your bridesmaids bouquets as centerpieces at your reception is another way to get more bang for your buck. Let's be honest, what else are you going to do with those things? We also took on some DIY projects, including making our own floral chandeliers. I printed as many things myself as I could, including menu place cards, our church programs and welcome cards with a schedule in the hotel welcome bags. I was also able to save money (and time) because I never did a hair and/or makeup trial. I've worked with both my hair and makeup artists several times and knew they could pull anything off! Technology will also become your best friend during this process. I relied on free platforms, like Google docs, to help keep track of everything. From budgets, to who was coming to the rehearsal dinner, to addresses for all of the guests, RSVPs and more, it made our lives so much easier to be able to access all of this information during meetings or on the go. I also created a timeline of the weekend and shared a digital version with members of the wedding party and family. Making sure everyone has as much information as possible will lead to less confusion and time wasted on the day of! Even the best, most prepared brides will run into something unexpected the week of. All of the sudden you’ll feel like you’re just hemorrhaging money. I’d recommend keeping about 5-10% of your budget for these last-minute surprises. If you don’t use it, that’s extra money for your honeymoon, but if you need it, you’ll be so glad you have it on reserve! Lastly, don’t take things too seriously. Don’t get too caught up in how you think your wedding should look or what other brides are doing. Your wedding is all about you and your future husband, so enjoy that! Things will go wrong on the day of, but just roll with it. More than likely, you’ll end up laughing about it at breakfast the next morning anyway! BONUS content: I really can't say it enough, just go with the flow on the day of. The more work you do in advance, the more you'll be able to relax the day of. I made a schedule of hair and makeup for the girls so the day ran efficiently and smoothly. We stayed right on track and had time to spare! Make sure you take time to eat and really enjoy yourself. The things that went wrong are funny now and no one will know anything went wrong except for you. We had all kinds of things go wrong with our whole process. I haven't really gotten into too much detail here, but I will eventually. But to sum it up quickly, we had to find a new venue two months before our day of. We got passed from Priest to Priest. A volcano erupted in our honeymoon location so we had to relocate. We got 3' of snow the night before the wedding. So on the day of when my niece, Sofia, told me she didn't want to wear her flower girl shoes and wanted to wear her Uggs, I told her I wished I could do the same! She looked ADORABLE coming down the aisle in her boots. Just go with it! There was nothing (big or so small, like a shoe change) that could have taken away from the excitement that I had to marry Luke. So just keep the end goal in sight and you'll be just fine. Wishing all you engaged couples the best of luck! BONUS content: Here is a full list of our vendors (in no particular order)! I hope I didn't leave anyone out!! Vintage Rentals: Pretty Little Vintage Co.